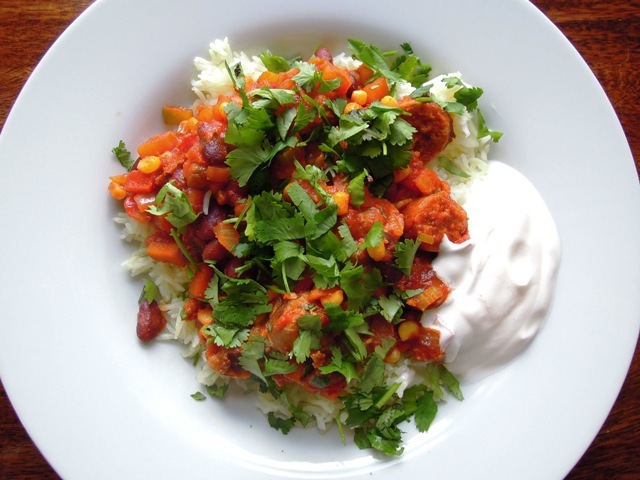 I feel a bit of a fraudster posting this sausage chilli on my blog. Firstly, it’s not actually my recipe. It comes from Sarah over at The Garden Deli, who is as talented in the kitchen as she is in the garden. Sarah really wanted to enter April’s Recipes for Life challenge – the three set ingredients this month are pork, sweetcorn and tomatoes. As a vegetarian, she obviously found the pork element a challenge too far. And so we agreed that Sarah would create a vegetarian dish and I’d then try out her recipe to see if it would also work with meat. The second reason I’m feeling a little fraudulent is because I wasn’t even the one to try cooking Sarah’s dish. I handed that honour over to my husband Jason. This means Sarah’s recipe received a proper testing. Not that Jason’s a bad cook. He’s actually a very good cook indeed and is probably one of the main reasons I got into cooking in the first place. No, it’s not a case of him being useless in the kitchen and needing clear instructions. It’s just that he is very thorough and precise and when he’s following a recipe, rather than his own instincts, he’ll follow it to the absolute letter. The verdict? We all loved Sarah’s sausage chilli and can wholeheartedly confirm it works just as well with pork sausages as it does with vegetarian ones. Jason found the recipe instructions absolutely faultless (although his hands are clearly much larger than Sarah’s when it comes to measuring coriander by the handful) and he had no problems on that score. It’s a feast of colours, flavours and textures, and perfect for little ones as it has just the right level of spice without being too hot. This is my kind of tasty, healthy, family food and a recipe I’m sure we’ll be coming back to again and again. Thank you Sarah! You can find Sarah’s original Sausage Chilli recipe here. We hardly played with it – simply substituted the vegetarian sausages for pork ones, and used frozen sweetcorn instead of tinned. Bigger hands are a definite advantage when it comes to measuring out coriander! Thanks for testing the recipe (and thanks to your husband too, of course) – so pleased it worked ok with pork sausages! 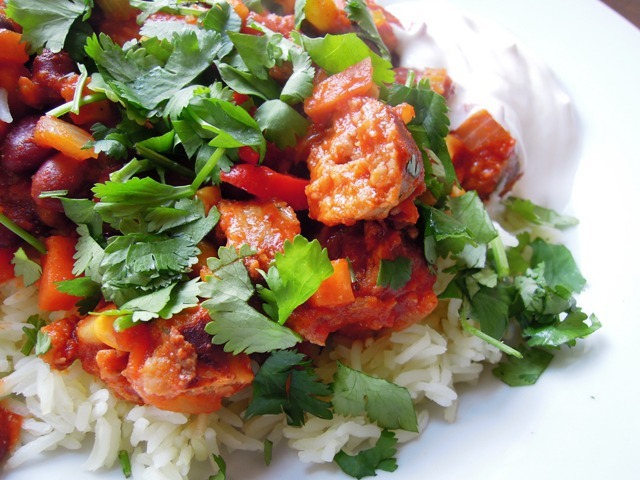 this looks lovely…I’d be quite happy with all that coriander on the top too!